Have you baked with buttermilk or made shortcake before? Oh, I am sure you have heard of buttermilk biscuits, maybe had it in pancakes or even a cake right? If not you sure are missing out! The buttermilk is the best addition to this shortcake in flavor! 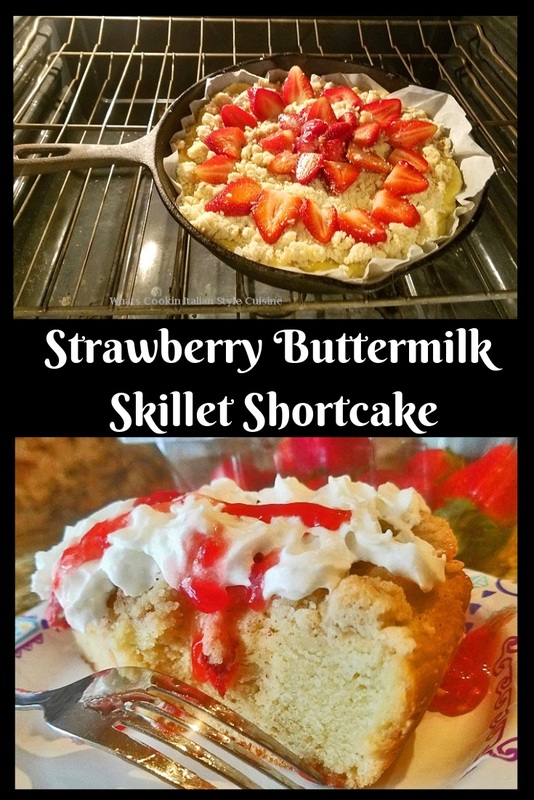 This Strawberry Buttermilk Skillet cake is out of this world delicious. There is more than one reason why it's so tasty. First, it's the buttermilk that helps make this flaky crust, then there is a streusel on top that is fabulous in flavor. The best part of the cake is, the strawberries are baked on top all in a cast iron skillet! A slice of heaven when topped with whipped cream or even your favorite flavored ice cream swirled with a fresh strawberry puree topping! 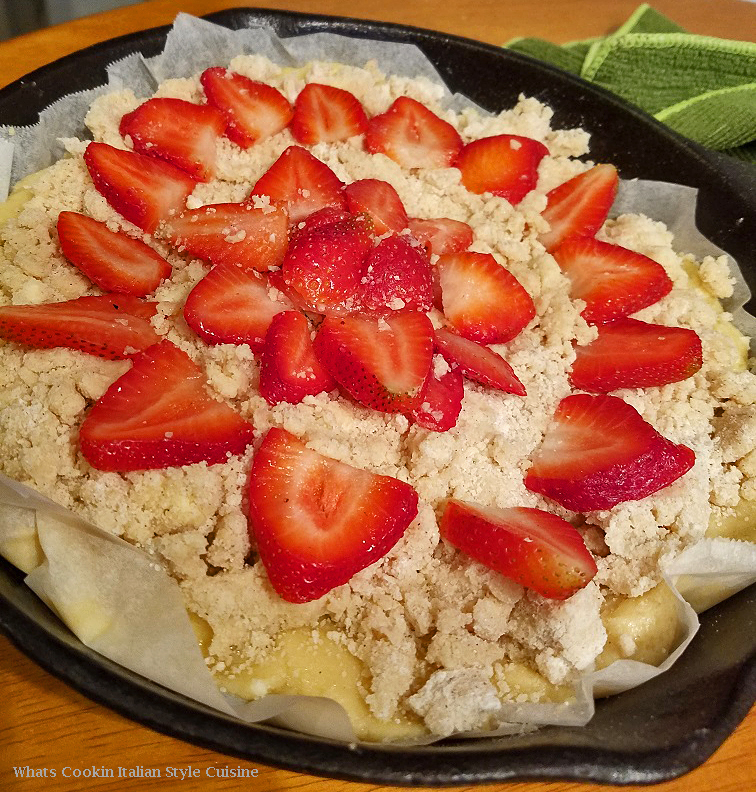 Come join me in making this fabulous first Spring dessert with fresh strawberries. 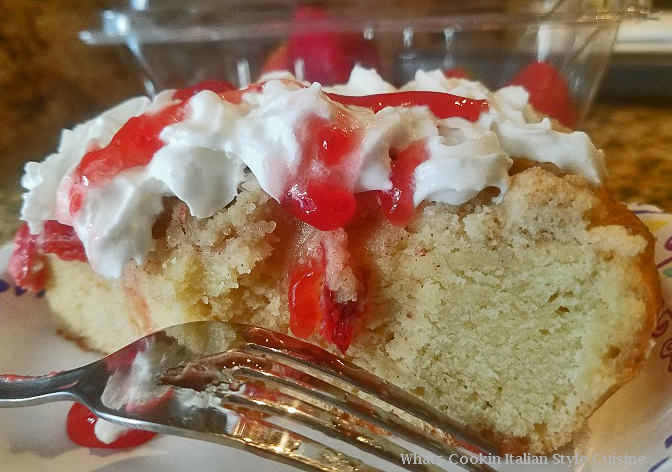 This is certainly a delightful change to the Traditional Style Strawberry Shortcake. Using all homemade fresh ingredients baked all in one skillet! After one taste, I am sure you will be baking this recipe time and time again throughout the whole summer! Scroll down for this fabulous recipe! This is my go-to recipe when Spring has sprung and Strawberries are in abundance. This flaky shortcake crust is divine and the whole cake is irresistible. I absolutely love the streusel with a hint of fall flavors also, it's very different from the traditional strawberry shortcake. This has an old fashioned shortcake flavor with an almost cake-like thick batter. When the whole cake is baking everything just melds into one perfect shortcake and it's delicious served warm or cold! This strawberry buttermilk shortcake made from scratch is truly moist and bursting subtle delicate flavors! It's the perfect all in one skillet for brunch or after dinner dessert. This brings a warm smile to my face, with great memories of my childhood to our table every time I bake it. Mom always made this in her cast iron skillet, I am happy to still have hers and can make this in her memory. 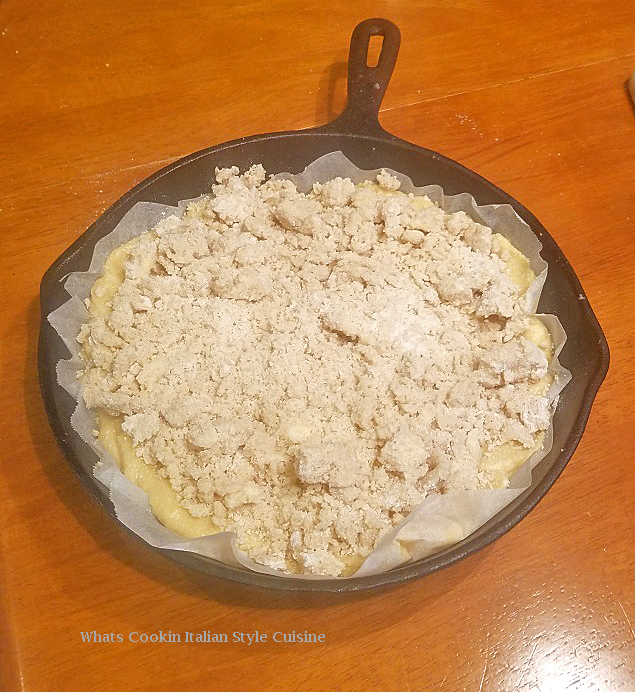 You can use any kind of baking pan you have, fitting a 9x9 or 10-inch baking pan. I love the skillet for not only baking but even for presentation, it gives the shortcake that old fashioned goodness. A huge scoop of my favorite homemade strawberry ice cream is always served with this. It's a very easy recipe to follow and you will not be disappointed with the results. I know how pretty this looks to serve but placing the strawberries in a flower pattern, it's so easy. Just slice the berries, make sure you blot them dry before placing on top of the streusel. Keeps the endpoints of the sliced berries all in one direction in a circular pattern. Sprinkle the top of the berries with a cinnamon and sugar mixture or just regular sugar for a sparkling look after they bake. This buttery streusel topping is so yummy. Make sure you use cold butter when making this mixed with the ingredients. This keeps its form and makes the perfect crumb topping. You can omit the spices if you don't like them. Watch carefully that the cake doesn't overbake as you would want to ensure the moisture in the cake isn't compromised. Use a toothpick in the center to see if it comes out clean it's done! 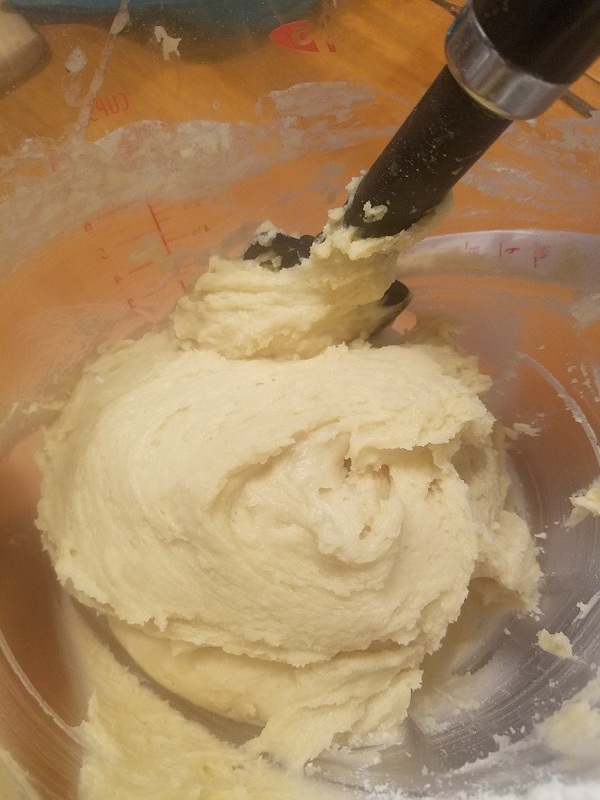 The batter is very thick and you will need to spread it with a spatula. Don't overmix this batter just blend it together until the white streaks are gone. Smooth into your prepared pan. 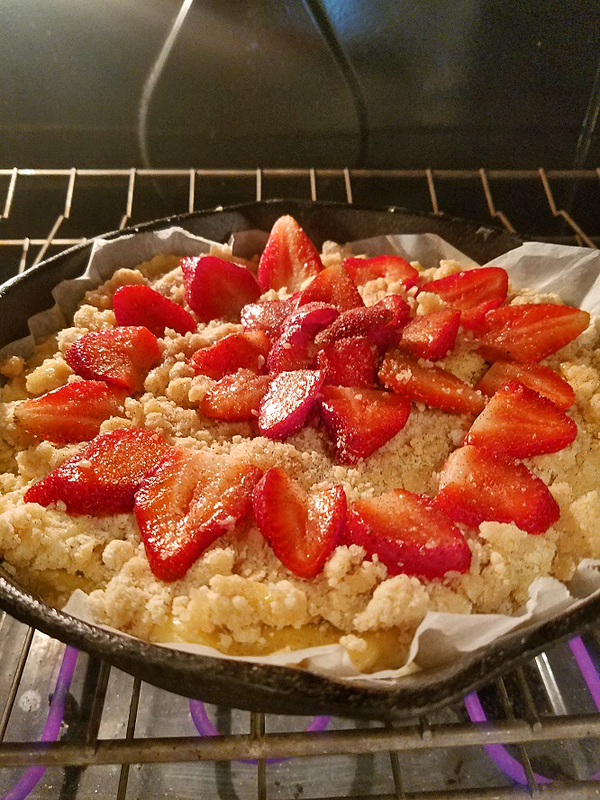 I understand many folks have fruit allergies, don't be afraid to substitute your favorite fruits to make this skillet shortcake. I have made this with blackberries and raspberries combined, peaches and even apple. I am sure you can get creative and use any fruits you prefer. Just save a few fresh strawberries for a garnish to drizzle over the top. I usually add around 6 to 7 washed fresh berries to the food processor with either sugar or a sugar substitute and pulse until it's a liquid. When serving just drizzle over the top of the whipped cream. 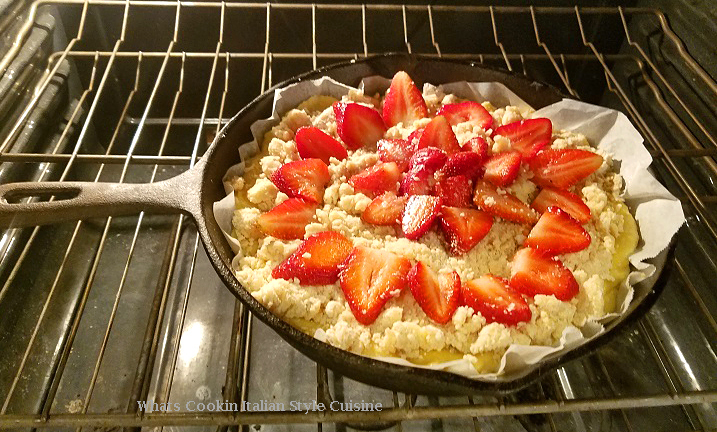 Watch my Quick Video Clip on this Skillet Shortcake Recipe! Preheat the oven to 350 degrees. 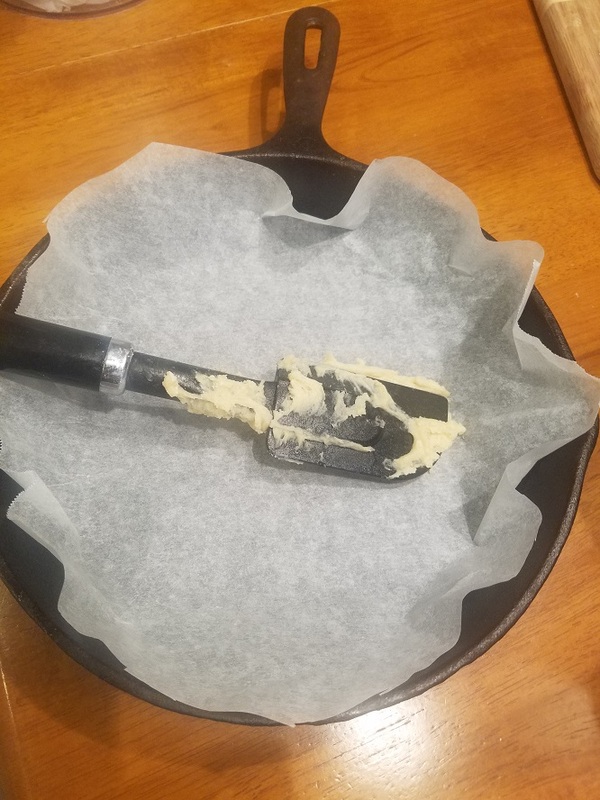 Line or butter a 10-inch cast iron skillet with parchment paper or heavy grease a 10-inch inch square baking pan with butter. Set aside. In the bowl mix the shortening and sugar together. Beat in the egg into the mixture and beat then stir in the buttermilk. In a separate mixing bowl combine the 2 1/2 cups flour, baking powder, salt, mix together thoroughly. Slowly pour into shortening batter until well combined. Combine 1/2 cup sugar, 2/3 cups flour, and the cinnamon and allspice in a small mixing.bowl. Add the softened stick of butter and mix until crumbly. Spoon the batter into the prepared skillet or any 10-inch square baking pan. 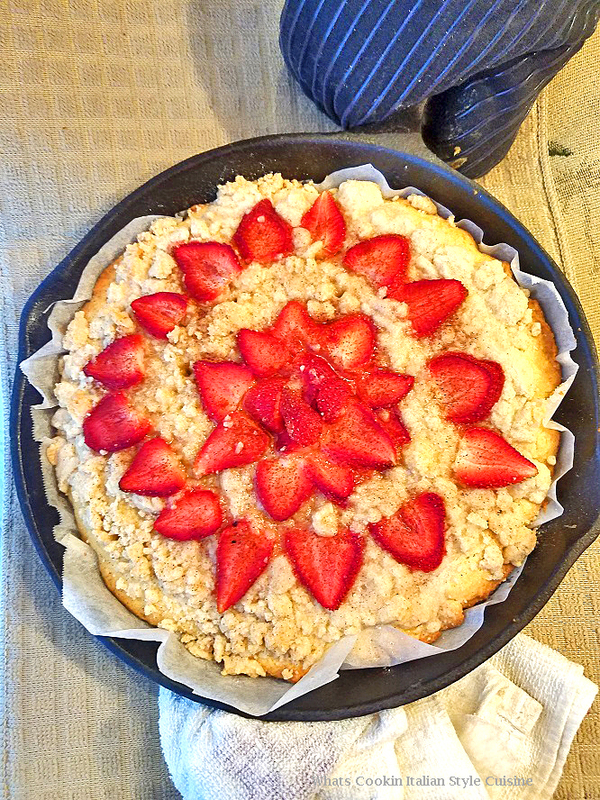 Make a pretty design with the sliced strawberries on top of the streusel/ batter in your baking dish. Bake in the preheated oven around 50 to 60 minutes or more depending on if the middle comes out clean with a toothpick and the edges should be browned. Serve warm with whipped cream or vanilla bean ice cream and a drizzle of strawberry puree. My Best Buttermilk Blueberry Muffin Recipe! I can never resist anything with streusel! The shortcake looks so beautiful and simply perfect for the spring. i love homemade shortcake, but have never made mine with buttermilk. what a great idea. and that struesel topping looks incredible! This does look like a great way to enjoy strawberries. Happy spring! This looks like the perfect way to celebrate spring! I know my boys are going to devour this very quickly! I might need to grab my piece first, haha! This is one easy skillet cake recipe. Thanks for the detailed steps, so helpful. 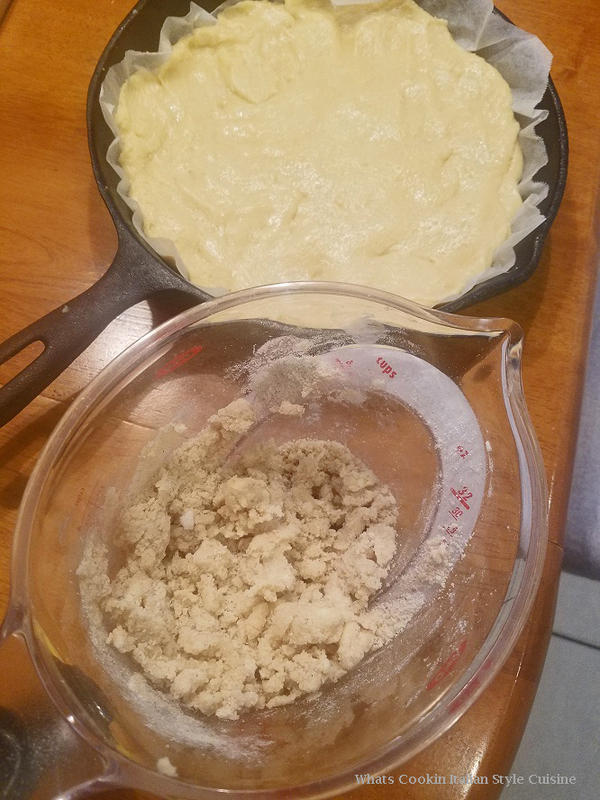 I love skillet cakes - so easy to make! 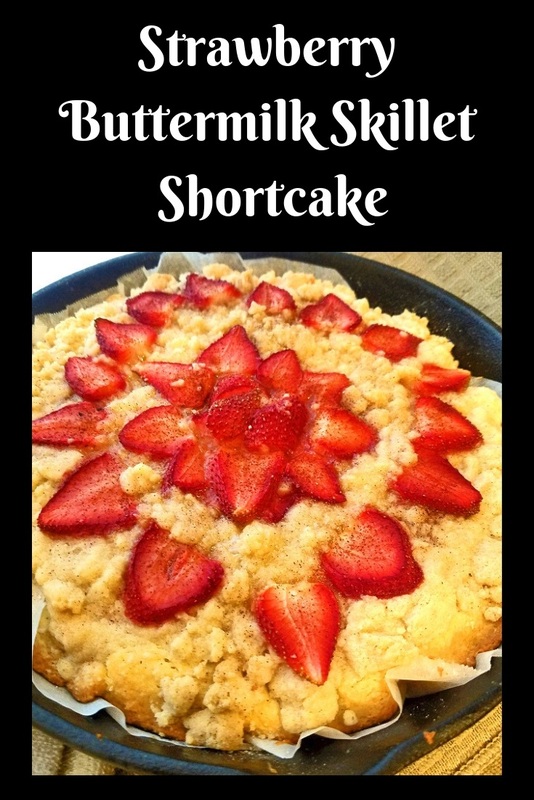 This looks so delicious, shortcake and strawberries are such a great combo! Good looking dessert Claudia, strawberry season will be here for soon and we have a farm about 4 miles away. SO yummy! And so much easier than making individual shortcakes!! I like using buttermilk in baking too and this shortcake looks absolutely divine! 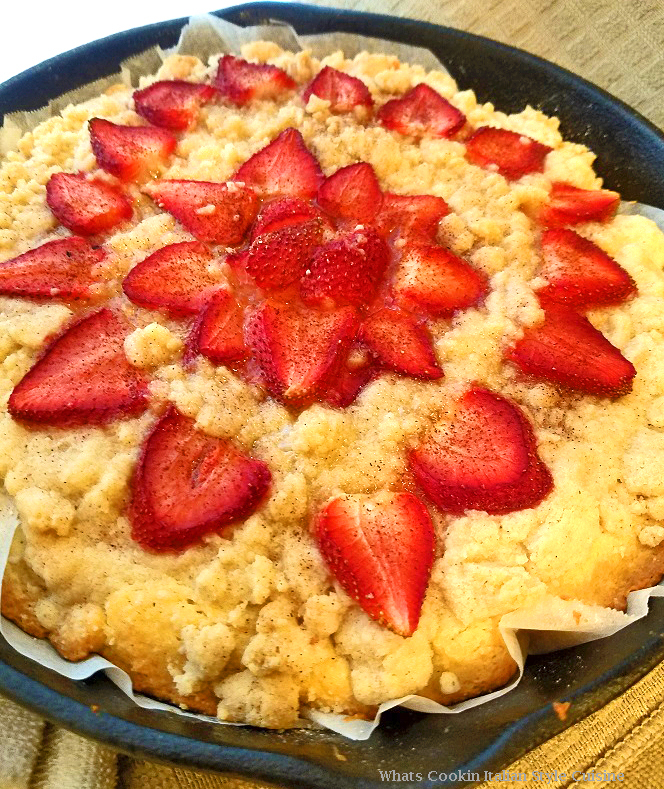 The streusel topping just adds extra deliciousness and all the strawberries, yum! I love strawberry shortcake! Looks so delicious and comforting! I'm bookimarking this for summer! We are so close to strawberry season, I can't wait to try it out. The topping looks so good. Thanks for sharing! This strawberry buttermilk skillet shortcake will be perfect for serving at our next supper club. I can't wait to host so I can make this yummy dessert. What an easy recipe and sounds so delicious! Looks like a great spring dessert! 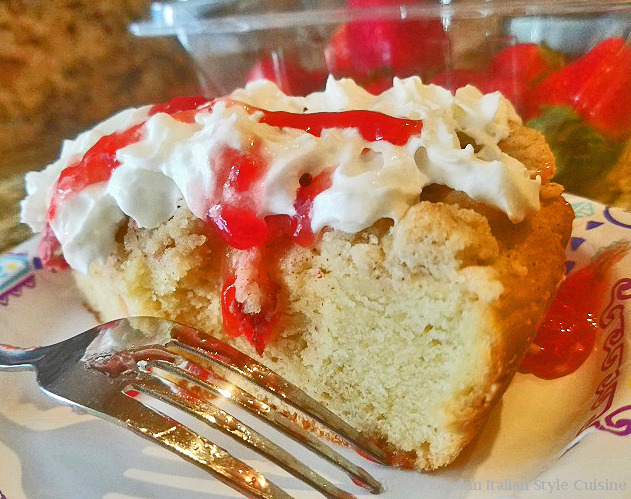 Streusel topped shortcake baked with strawberries...it sounds wonderful.